My favorite part in the Wizard of Oz is when Dorothy's house gets hurled up in a tornado and lands in Oz. I look forward to that moment when she slowly opens the door to reveal a world of wondrous color. Well, in my mind, that's what it's like to have a baby. Life is so much richer and vibrant, and yet it's unfamiliar and strange. The same goes for our careers after we have a baby. Whether we decide to go back to the same job or not, the way we engage with our work is forever changed from this experience. While things may feel turbulent and twisty, we are being given a great opportunity to redefine our careers. 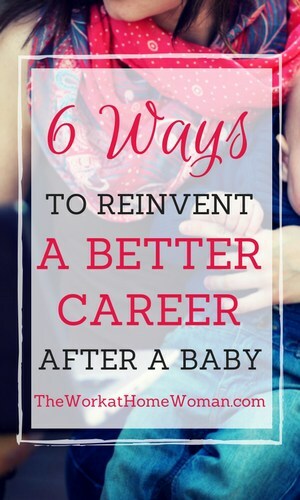 Here are some ways to reinvent yourself and get going on your path to a fabulous post-baby career. For those of you who are on maternity leave or have left your previous job in good standing, is there an opportunity for you to return to your same job with a different schedule? For a valued employee, employers are often willing to bend to retain great talent. Have you thought about job-sharing with a co-worker or going part-time? Examine exactly what would work best for you and find out what would work for your employer. Consider all possibilities: working from home, reducing your hours, freelancing, contracting, or a flex schedule. Once you've landed on your ideal work schedule, present a proposal they can't refuse. The money may not be as good, but this allows you to keep yourself in the game and enjoy your new role as a mom too. If you like your organization but weren't thrilled with the work you were doing before or perhaps the demands or stress of your previous job, is there an opportunity for you to move to a different role? Career coaches and counselors know this is the easiest way to transition your career. You already have your foot in the door, so changing jobs within your organization is an excellent way to begin a new line of work. If you can find a new position with your current employer that allows you to use your favorite skills while simultaneously reducing the hours or increasing your flexibility, this can be the sweet spot. Spend some time getting in touch with your strengths, interests, and transferrable skills to navigate your next move. 3. Move to a Family-Friendly Organization. If before the baby you were burning the midnight oil with your organization and you are clear that staying with this group will not allow you the work-life balance you need, it may be time to switch employers. Many organizations are known for supporting women and families through telecommuting and flexible work schedules. There are also other industries that can use your same skill set but don't require such a rigorous schedule. For example, many female attorneys who once were on the partnership track in a law firm opt for this type of career transition. One lawyer after having her baby went to work for a judge. She said that she wasn't making the same amount of money, but it was worth it to her to have the time with her child. Using your skills in a new work environment can help reduce stress, increase family time, and remove the pressure of working long hours. 4. Turn that Hobby into a Jobby! For those moms who have a passion, hobby, or interest that keeps them excited and engaged, there may be a way to turn that into a great career. One mom, a former massage therapist, took her love of improvisational comedy and got a job teaching improv to at-risk students in a middle school. The school also had a daycare which allowed her to leave her baby for a couple of hours while she taught classes. Another mom, a former teacher, took her passion for writing and publishing and started a professional writer's association that hosts an annual conference every year. This takes a little more creativity, time, and perhaps some serendipity, but it is all very doable. Don’t be limited by what you think is possible. Start talking to people about your idea, and you might be amazed by what transpires. If before you had your child you hated your line of work, the birth of your baby can be a perfect opportunity to start the career you've always wanted. As our population lives longer, people are working into their 60s and 70s. So if you are in your 30s and hate what you were doing before, don’t think it’s too late. You have a ton of time. Heading back to school or taking an online course is a great way to explore new career options and it's not unheard of at this stage of life. One mom was burned out doing social work before she had her baby. She took the time during her maternity leave and the baby's first couple years at home to go back to school to pursue a career in IT Healthcare. She was able to land a job working from home with her new skills and enjoyed an increase in pay too! For the entrepreneurial types, this may be your time. Is there a business you always wanted to start? One mom I knew was lost after the birth of her son. She knew she wanted to do something in the healing arts. She was a body worker who wound up creating her own healing modality. She took the plunge and marketed it into a business. Today she is certifying other body workers in this technique and not only works to heal clients with sports injuries, but she is also helping others to start their own business too. Many moms also go the direct sales route. Check out our blog here for more information on why direct sales can be the best job you ever had. Whatever it is you want to do, you have the power to create something that allows you the work-life balance you are seeking. It’s possible for you to have a career that works for both you and your family. Need some ideas to get your creative juices flowing? Here's a HUGE list of home-based career ideas for moms! Pam Farone is the Founder of Careerfulness, a career coaching and training company focused on bringing happiness to work. Pam lives in Louisville, Colorado with her husband and son. She loves tap dancing, performing improv with her girlfriends, and taking hikes with her family. Hi I am keerthana.need to work from home because of my baby..Give me some ideas .